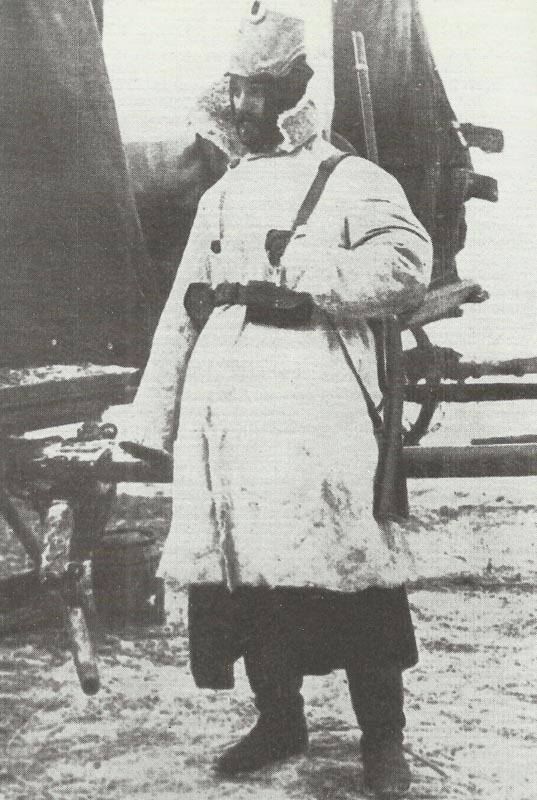 A German Landwehr private dressed for the cold weather. Meuse-Argonne: German reverses in Argonne and near Verdun. Alsace: French take Burnhaupt-le-Haut, but lose it next day. Poland: Heavy German attacks on lower Ravka on Russian Christmas Day repulsed. Serbia: Royal Navy 28-man mine and torpedo detachment from Malta joins Cdr H Cardale at Belgrade, they complete blocking of river Sava and add to river defences of Belgrade. Armenia: Battle of Kara Urgan (until January 15) between Turkish XI Corps and Yudenich, who outflank it from north between January 10-15. India – Northwest Frontier­: Captain Jothan of North Waziristan Militia ambushed by 1,500 Khostwals warriors, wins posthumous Victoria Cross. Italy: Corpo Aeronautico Militare (Military Air Service) established with a few Bleriot and Nieuport planes. France: Absinthe sale prohibited or new liquor stores. Russia: ­Bolshevik Petrograd ‘Military Group’ issues leaflet to soldiers, workers and peasants urging non-payment of rents by end of month.